On march 6, 1978 Fr. Fortunatus Andrade passed away to his eternal reward at Monte de Guirim , Goa. In the 61st year of his age and 38th year of his religious life. His mortal remains were laid to rest in the crypt of Alverno Friary on the following day. Fr. Fortunatus Andrade was born in Corlai, Alibag, Bombay Archbiocese on July 16, 1917. He did his high school studies in St. Anselm’s High School, Ajmer. It was here that he perceived that God was calling him to be a Capuchin. He was vested on March 1, 1936 at Monte Mariano, made his temporary profession on March 3, 1937 and his perpetual profession on March 3, 1940. 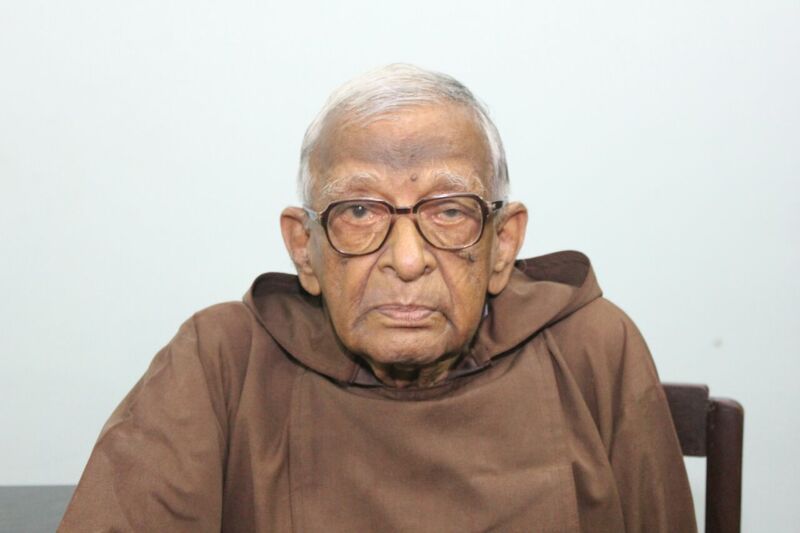 He was ordained priest on April 12, 1943 at St. Anthony’s Friary, Quilon. Fr. Fortunatus was a very talented friar. He was a well read man with a prodigious memory. He was also known for his mildness and humility and won the appreciation of all who came in contact with him. He taught in St. Anthony’ High School, Monte de Guirim and was librarian from 1950 – 1969; later on he was transferred to Quilon to take over the editorship of the Voice of Assisi. In collaboration with Fr. Adolph Mattakara, Fr. 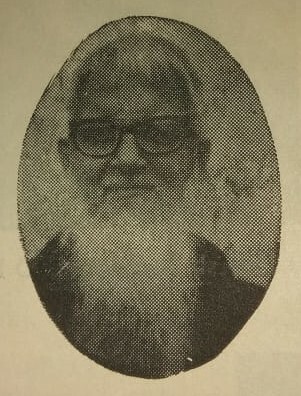 Fortunatus was responsible for compiling and publishing the History of the Indian Capuchin Province on the occasion of its Golden Jubilee (1922 – 1972). After the Voice of Assisi ceased publication in 1972, Fr. Fortunatus was back at Monte de Guirim where he functioned as Provincial Secretary and Archivist. The passing away of Fr. Fortunatus was rather sudden. He had attended all the sessions of the Provincial Chapter held at Monte de Guirim during the first week of March 1978. On the night of 6th March he suffered a massive heart attack which proved fatal. He peacefully passed away on the same night in the Ramanso Hospital, Mapusa. Within a week after the death of Fr. Fortunatus at Monte de Guirim, Br. 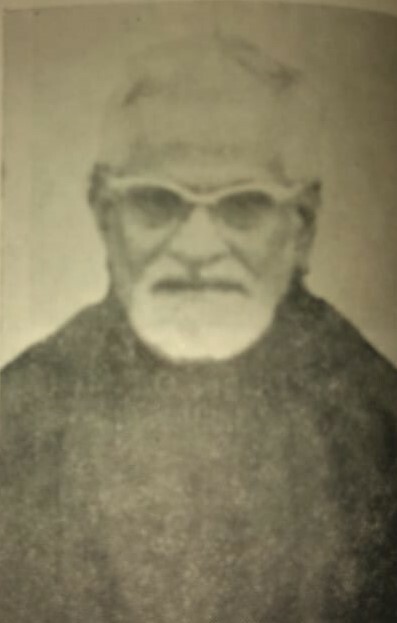 Simon Fernandes from the same fraternity also followed him to his eternal reward on March 12, 1978, at the age of 66 and in the 43rd year of his religious life. His body was laid to rest in the crypt of Alverno Friary, Monte de Guirim next to that of Fr. Fortunatus. Br. Simon was born at Tivim, in the Archdiocese of Goa on 20th March 1909. He joined the capuchin Order at Monte Mariano at the age of 22 and was vested with the Capuchin habit on 23 April 1931. He made his temporary profession on 24 April 1932 and his perpetual profession on 3 May 1936. After his profession he was assigned to Assisi Friary Alwaye and St. Anthony’s Friary Quilon and Amalashram, Trichy. Whereever he was sent, he worked hard for the welfare of the house. he was a man of innate simplicity, a man without guile and was loved by all who came in touch with him. He was very much dedicated to his work and did not idle his time. He suffered from an attack of Tuberculosis and had to be kept in a Sanatorium for a few months. Later on he developed diabetics and had to undergo an operation for cataract on both his eyes. Inspite of the many ailments he was subjected to. He could smile and thank God for everything. He was a man of prayer and spent a good deal of his time before the Blessed Sacrament. During the last years of his life he was assigned to the Alverno Fraternity, Monte de Guirim. He was in charge of the parlour and sacristy. During his spare moments, he used to visit the sick people in the neighborhood and console them, until he himself fell sick and was admitted to the Remanso Hospital Mapuca, where he peacefully passed away, welcoming sister death with the same serenity with which he had accepted his many ailments. On October 14, 1987, Reverend Fr. Diego Sequeira, OFM. Cap. Of the Holy Trinity Capuchin Province of India went to this eternal reward. He seems to have had clear premonitions of his approaching end, since St. Alphonsus Liguoury’s “Preparation for Death” was always within his hands’ reach during his last few weeks, and since he had very devoutly received the Sacraments both of Reconciliation and of the sick, shortly before his departure from this world. He had always been a man of deep faith and solid conviction, of simple and humble dispositions, and of unstinting service especially to the poor and the helpless. Little wonder then, that a large crowd of the clergy, the religious and the laity, led by the Archbishop of Goa, Daman and Diu, braved the sweltering October heat and the steep Monte De Guirim slope to pay their last respects to one who in life had been esteemed as a devout priest, a fervent religious, a gifted writer, an indefatigable preacher, and a respected spiritual Father. Fr. Diego, baptised Gregory Francis Sequeira, was born of devout and God fearing parents, Diego Salvadore and Leopoldina Sequeira, at Nachinola in Goa on November 17, 1903. After his early school education in Goa, he went to Calcutta and then to Bombay where he worked for a couple of years as a stenographer. Although busily engaged in the world he never took to the ways of the world. The solid Christian formation he had received at home and the fidelity with which he frequented the sacraments were as he himself avowed, providential means through which the Lord was gradually drawing him to a life of service of Himself and of His church. In 1925, he went to Ajmer in answer to a call to serve in the missions. While over there, he came in contact with the Capuchins, was attracted to their way of life, and formally requested to be admitted into the Order. After he had been granted permission to enter the Order by Fr. Armand of Vannes, who had been the Father ‘commissary at that time, he was vested in the Capuchin habit on June 11, 1927, made his Novitiate at St. Fidelis Friary, Sardhana, and made his Simple Profession on June 13, 1928. In religious, he took the name Fra. Diego of Nachinola. As the Capuchin Order did not have its own Major Seminaries in India at that time, the young Fra. Diego was sent to Breust – Eysdem in Holland on August 15, 1928 where he studied philosophy until July 8, 1931. On June 13, 1931, he took his solemn vows. Then, from October 18, 1931 to July 30, 1035, he was sent to the Capuchin International College of St. Lawrence of Brindisi in Rome for his Theological Studies, and was ordained priest on July 30, 1933. 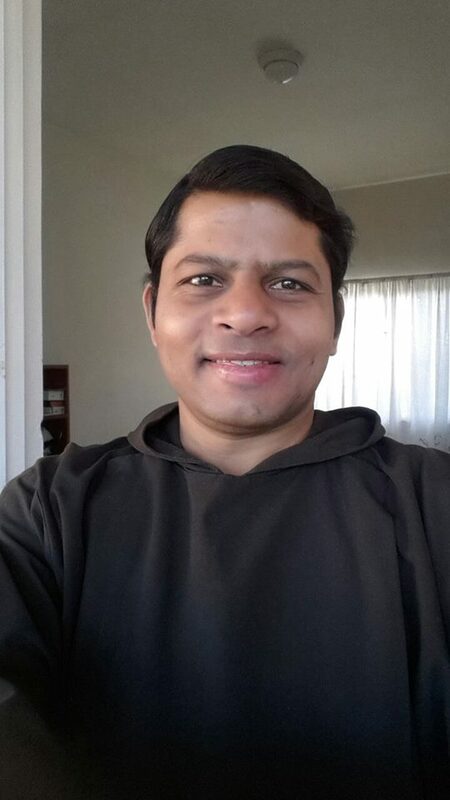 On his return to India, the young Fr. 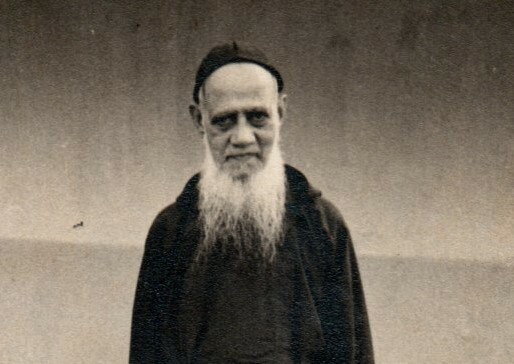 Diego was assigned to St. Anthony’s Friary, Quilon in Kerela, where he was Professor of Theology and Canon Law from September 28, 1935 to February 26, 1937. Thereafter, he held several important offices in the Order and in the Church which he discharged with exemplary zeal and self – forgetfulness. From February 28, 1937 to November 22, 1941, he was Novice – master at St. Fidelis Friary, Farangipet, Dakhshina Kannada. The following ten year saw him traversing the length and breath of Goa from Mapusa and Monte de Guirim as a Teacher, Preacher, Writer and Third Order Commissary. From November 11, 1951 to July 1957, he was Parish Priest at St. Ignatius Church, Mandvi, Bombay, where he worked untiringly to nurture the faith of the local people and the Goan community settled in that area. 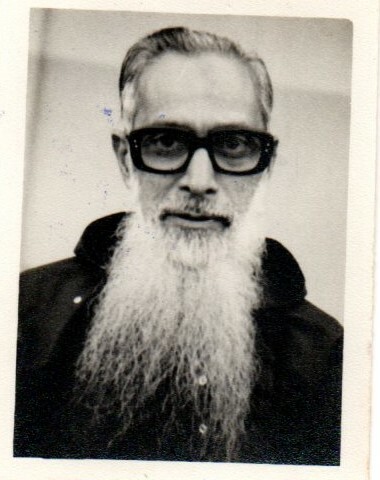 From July 1957 to September 1965, he was appointed Superior of Alverno Friary, Monte de Guirim, Goa. During this period, he continued ceaselessly to build and to strengthen the faith of the people through both the written and the spoken word. Thereafter, he served the Order and the Church successively as Provincial Definitor, Chaplain at Davorlim in Salcette, Goa, Parish Priest at Mandvi, Bombay, and Superior at Padre Pio Friary, Navelim, Goa. In June 1977, he continued to minister to the people as Spiritual Father and Confessor and did not cease to write on spiritual matters in various periodicals. His love of community life was so great the he participated in almost all the community exercises with edifying fervour and regularity. Indeed, it was while he was at one of such community exercise, namely, at lunch, that he was take seriously ill.
On Monday, October 12, 1987 while he was having his lunch together with the community, his head all of a sudden slumped into his plate and he began to gasp for breath. The community members at once rushed to his aid and tread to ease his discomfort while the nurse from the Boarding premises was summoned and the doctor from Mapusa immediately set for. After a few minutes, he regained his composure to some extent and was taken to his room where he was made to relax on his bed. When the doctor came to his bedside, he made a thorough checkup as the circumstances would permit and advised immediate hospitalization saying that he had a heart attack and that his heatbeat had slackened dangerously to around 40 beats per minute. The ambulance was at once summoned from Panjim. In the meantime, Fr. Diego was given the last rites which he received with inspiring serenity and devotion . while he was being placed in the ambulance, it was striking to see him smiling broadly. The though struck some of us that he seemed more like one who was setting out on a long awaited and earnestly desired journey rather than one who was seriously ill and on his way to the hospital. We were sure that within a matter of days Fr Diego would be returning to us. However, he seemed to feel differently, for he then said: “if I die please do not cry. Please also tell my relatives that when I die they should not cry.” His joy was indeed that of one setting out on his eternal homeward journey. On his arrival at the Goa Medical College, Fr. Diego was at once admitted into the intensive care ward where the doctors and nurses, at our earnest request, assured us that they would do their very best for him. All through Monday and Tuesday the friars of our community took turns in keeping him company and in attending to his needs. He spent much time in silent prayer and often expressed his anxiety at the inconvenience he was causing both the medical personnel and his confreres. At around midnight on Tuesday, he spoke movingly on spiritual things and again expressed his grief at the trouble he was giving others. He also humbly begged pardon of all those whom he had knowingly or unknowingly offended. Often during the night, his hands kept on moving as if he was celebration Holy Mass. He also spoke very touchingly on Our Lady and expressed his great desire to die on October 13th, (Our Lady of Fatima’s day). At 3:30 am he told the friar who was attending on him that he had just said his Divine office by heart and that he was praying for all his confreres. At about 6:45 am on Wednesday morning, he drank the coffee that had been brought for him, and spoke of the need for prayer in our lives, of the transitory nature of the things of earth, and of the importance of leading a simple and God – fearing life. At around 7:05 am, he suddenly began to agitate his legs and to gasp for breath. The nurse in attendance at once began to massage the area near his heart while the doctors were urgently summoned. The medical treatment given revived him to some extent. The recovery, however, was only an apparent one. For, at around 8:05 am Father indicated that he experienced server pain in the area near his heart. The doctors once again gave him a variety of medicine and treatment to revive him, but all to no avail; For, the needle of the instrument recording his heart condition fluttered wildly a bit and then gently descended to zero. The time was 8:20 am of Wednesday, October 14, 1987. On Friday, October 16, 1987 in the presence of a large gathering of the clergy, the religious and the laity, Father Theodore Pereira, the Superior of Monte De Guirim, celebrated the Eucharistic Sacrifice and preached a fitting sermon highlighting the beautiful manner in which the Lord had done great things in the life of our dear Fr. Diego and through him in that of thousands of others. After the Eucharistic con-celebration, at which there were around 40 priests present from all over Goa, the Arch bishop of Goa, Daman and Diu, the Most Rev. Dr. Raul Gonsalves, conducted the funeral rite and laid our dear brother to rest in our friary cemetery. That the Good Lord will speedily welcome him into his loving presence and give him eternal rest is our heartfelt and earnest prayer. It was on the 30th of October 1995, a 4:30 pm that Rev. 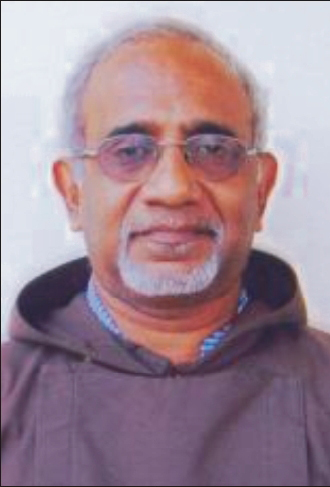 Father Irenaeus D’souza breathed his last at Alverno Friary, Monte De Guirim due to cardiac arrest. Our brother, Father Irenaeus had run his race and the good Lord in his clemency called him to his eternal reward at the age of 72. The bodily death of Fr. Irenaeus was not sudden nor unexpected. His was a prolonged illness with many complications of he heart, stomach and nervous system. Years of heavy medication rendered him extremely weak. All along his suffering and even to the last days he was alert in mind and saw everything happening around him with keen interest and loving concern. His prolonged illness which partially incapacitated him did not dampen his zeal for religious life and sporting spirit. He attended all the regular exercises with punctuality. He followed with interest the local, national and international sporting events and rejoiced with legitimate pride when our school fared well in sports and studies. Fr. Irenaeus was born at Bastora a verdant village in the heart of Bardez taluka in Goa on 15th March 1923, of devout parents Mr. Andre Floriano D’souza and Mrs. Florinda D’souza. His brothers Cajetan, Francis and John have gone ahead of him and only their sister Guilhermine Cardozo is the lone survivor of the family. From his early age Fr. Irenaeus showed signs of priestly vocation. He left behind everything and joined the diocesan seminary at Rachol. He persued his studies with eagerness and was ordained a priest of God on the first of October 1950. Within a short time he asked to join the Franciscan Capuchin and was accepted and made his solemn profession on 7.1.1955 at Monte Mariano at Farngipet. Ever since his joining the Capuchin order he served in various responsible capacities for several year. He had been Superior and Principal of Alverno Friary, Monte De Guirim for nine years. He served the same institution as Vicar for three years and as member for four years, till the year he died. While at Monte de Guirim he promoted vocations to the order and built the Apostolic school and served as its first director. Sicne he was an expert in Portuguese language he trained the students for the then Portuguese exams. Fr. Ireanaeus also served as the headmaster of St. Anthony’s Primary school for a couple of years. From Monte de Guirim he moved on to Davorlim, a village in Salcete from where he negotiated for a new foundation and thus became the pioneer and the first superior of Padre Pio Friary. Obedient as he was he moved on to Revora and served as the assistant parish priest for some time. From Revora he was transferred to Monte de Guirim on the basis of ill health. All his energies were spent in administration, preaching and promoting vocations to the order. He had been elected three times to the provincial council. All these responsibilities did tell upon his health. Fr. Irenaeus’ mortal remains are laid to rest in Alverno Friary, a place he loved and served for long years. The funeral mass was attended to by several priest, religious and vast number of relatives, friends and ex-students of the school. He was laid to rest amidst richfloral tributes, prayers and gratitude to God his gift to the church, the Order and society. The memories of our beloved brother Irenaeus will remain indelibly impressed in the minds and hearts of his Indian confreres and especially the brothers of the Most Trinity province who pay their loving tributes to their brother Irenaeus through this obituary. Fr. Joaquim Camilo Fernandes was born on the 15th of June 1952. Though hailing from Morjim, Bardez, Goa, he was born and brought up at Dadar, Mumbai. His father expired when Fr. Joaquim and his brothers and sisters were very young. Being the eldest in the family greater responsibility fell on his shoulders. He carried out his responsibility very well and helped his mother in her task of bringing up his 2 brothers and 3 sisters. He was a teacher by profession. He worked as a teacher till he decided to join the Capuchins. After helping his brothers and sisters to stand on their feet he decided to follow the Lord who was calling him. He bid goodbye to his home and knocked at the door of the Capuchins. After being received by his superiors he was sent for his Aspirancy and Novitiate at Monte Mariano, Farangipet, Mangalore. He made his First Profession on the 2nd of June 1982 and then went for his philosophical studies and graduation at Bangalore. He was a regent at Alverno Friary, Monte de Guirim. Thereafter he went to pursue his theological studies in Mysore. He made his Solemn Profession in the Order on the 21st of May 1987. As a deacon he served in the Revora parish. As a deacon, he diligently prepared his sermons and tried to improve his command over the Konkani language. He was ordained at Dadar, Mumbai on the 28th of April 1991. Preacher of God’s Word: He spent a lot of time preaching God’s word. Sitting silently at the Lord’s feet he reflected on his word and diligently prepared himself to break God’s Word to his people. He spread the Word of God to every nook and corner of Goa. He was particularly invited to break God’s word to the people during the novena services. True to our Capuchin tradition he spent a lot of time in the confessional, reconciling people to God and to one another. Director of SFO: He loved his Franciscan vocation. He desired that St. Francis of Assisi and the way of life taught by him be made know among the people. He left no stone unturned to promote the SFO in Goa. Within a short span of time, he with his zeal and tireless work established 19 fraternities in Goa. Like a brother to the tertiaries he shared in their joys and supported them in their sorrows. He made the SFO members aware of their responsibility towards the Church and urged them to help the parish community in their parishes. It was through the SFO and with their help that he was able to reach out to the poor of our society and help them in whatever way he could. A Good Pastor: He was the parish priest at Sinquerim. As a good pastor he took care of the flock entrusted to his care. He worked zealously for the good of his people. He had a soft corner for the prisoners. He would visit them at Aguada Fort every week and would comfort them and reconciled them. They used to wait for him to celebrate the Eucharist. Christmas and Easter celebrations were the happiest moments for the prisoners. The lepers too were not neglected. He used to visit them in the company of the tertiaries. They used to eagerly wait for the arrival. A Joyful Brother in the Community: How good it is to see brothers living in a community. St. Francis of Assisi wished that his brothers lived in a community. True to the Franciscan charism. Fr. Joaquim’s greatest desire was to be in a community. He drew strength and grew in the company of his brothers. He was a good brother and contributed his share in the building up of the community. He would share his joys and sorrows with his brothers. At times due to pastoral commitments he had to be away, yet he longed to be in the company of his brothers. He tragic death has saddened all. The last rites were held at Alverno Friary, Monte de Guirim, a place he loved much. A large number of priests, sisters and lay people were present to bid him the last goodbye. The Vice Provincial of Goa was the main celebrant. A fitting homily was preached by Fr. Simon Rico Fernandes, during which he highlighted the good life lived by Fr. Joaquim. Amid tears, the body of Fr. Joaquim was laid to rest at the Alverno Friary Cemetery, Monte de Guirim. May the Good Lord reward Fr. Joaquim with eternal happiness. Home we brought our beloved brother dead. The greatest mystery of life is that ‘Death keeps no calendar’. This is exactly what happened to our Br. Polycarp on March 12, 2007. We saw Br. Polycarp moving, we heard his speaking, we experienced his presence during our supper and no one even imagined that these moments would be the last treasuring moments of our lives together. Sweet moments turned sorrowful when we heard an unusual sound. We all rushed into the room of Br. Polycarp only to see him helplessly lying on the floor. Sensing his struggling state, we rushed him to the J.M.J hospital. His failing condition prompted us to administer the Sacrament of Healing. As soon as he received it, Br. Polycarp welcomed sister Death to leave earth and to step into the shores of heaven on March 13, 2007 at 12:05 am. His sudden demise helped us to realize that death has a thousand doors to let out life. Blossom by blossom the spring begins and step – by – step human history progresses. This is exactly what happened to Br. Polycarp when he was born to Balthazar M. Fernandes and Maria Pia S. Jaques Fernandes on June 6, 1924, in the land of sea and sand famously known as Colva. His baptismal name was Francisco Norbert Fernandes. He took the Franciscan habit on February 17, 1950. He made his simple profession on February 18, 1951 and made his Solemn Profession on February 18, 1954. 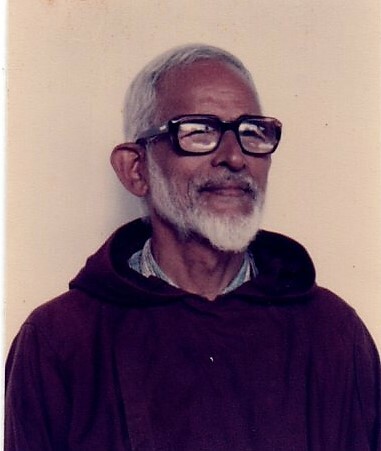 He spent his life in the Capuchin Order by rendering his services at St. Ann’s Friary, Mangalore – first as a student doing a course in Infirmary (1951) and then as a member of the friary, assisting in the Chapel of the friary (January 1953 – May 1953). 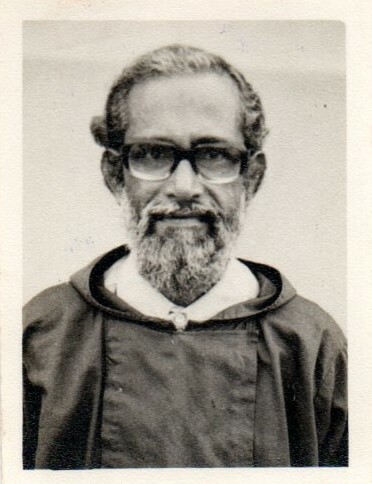 He shared his valuable service in providing the daily table to the friars of St. Joseph’s Friary, Kotagiri (December 1951 – January 1953). He was a parent to the boarders of St. Anthony’s boarding house when he was appointed as the Asst. Boarding Director and Infirmarian at Monte de Guirim, Goa (May 1953 – June 1976). He crossed the boundaries of Goa to lend a helping hand in the Fatima Friary, Bombay (June 1976). From August 10, 1982 onwards Br. Polycarp has rendered his services in different friaries in Goa – he made his presence felt at Alverno Friary, Monte de Guirim; Padre Pio Friary, Navelim; St. Lawrence Church, Sinquerim; and Shanti Niwas, Cuncolim. The greatest moment of his life was when he celebrated the Golden Jubilee of his consecrated life on February 19, 2001. Br. Polycarp was tuned to God 24×7. He was a model of prayer; ipso facto by his 100% presence, he challenged each one of us to make prayer our way of life. The fruit of his prayer life was well extended in all that he said and did. Br. Polycarp remained true to these words. Faithfully he went about doing his work with a bright smile on his face. The ex – boarders who studied at Monte de Guirim have volume of stories to vouch for this statement. They remember his parent figure when he was an infirmarian, a tutor when assisting at the altar and a generous host with long flowing beard ever ready to welcome any one at the parlour to have an experience of Capuchin hospitality. All this helps us to reflect that he was not for an age, but for all time! Poverty and humility are twin virtues that are sine qua non for a Franciscan and Br. Polycarp possessed it in abundance. Br. Polycarp always dressed himself with the garments of poverty and humility. As a pilgrim and stranger he was happy with the few necessary things he required for his daily sustenance. His humility sparked out in his words and deeds. Observing his inspiring life, pointing our fingers to his exemplary life today we can proudly preach saying, ‘sow a character and you reap a destiny’. Love was the forte of Br. Polycarp. He showed his love in action when brothers were sick by inquiring about them. When brothers visited their homes, he was the first one to inquire about the family members. Truly, his life proves that history of the world is but the biography of great men and women who learnt to love, who express love, who teach to love and who work for love till their very end. Br. Polycarp had the innate gift to sense the need of others. He was a friends of the poor, comforter to the workers, medicine to the sick, consoler to the troubled, faith restorer to the doubtful, smile to the crying, pillar of strength to the weak, ray of hope to the famished and bridge builder to the broken hearts. Small children would gather around him to seek his blessing. Surely, great actions. When our beloved brother died darkness descended on us. We felt lost, bereft, forlorn. But gradually the lights began to come on as we recalled the good deeds done by our brother. In this strange and beautiful light. We not only find our way, but find the meaning of life itself. Perhaps to cap it all, Br. Polycarp’s eighty – three years of journey deserves an epitaph with these inscriptions: “Here lies our beloved brother who lived and died gladly”. Written by Br. Waldheim Rodrigues OFM Cap. The friars of the Vice – Province of Goa were anxiously waiting for the day when Bro. Peter would gloriously complete his century, but God had His way. On the 28th of April 2009 in the night at Padre Pio Friary Br. Peter called the friars to his room, complaining of chest pain. The doctor, who attended on him, suggested shifting him to the hospital. There he was kept in the ICU for 6 days with great care of the doctors. However, on the 4th of May he suffered yet another major attack and his hear failed to respond to all the Provincial and a few friars, Br. Peter breathed his last. The dream of a century was over. God had blessed him with 99 years of fruitful ministry, and called him to celebrate his century in heaven with the saints and angels. “What we are is God’s gift to us; what we become is our gift to God.” These words were always in the heart, mind and on the lips of our Bro. Felix Ferrao as he sort to live these words in his life. His commitment to life was based on this realization that we are God’s gift to one another. And so he reached out to others with care, concern and generosity. 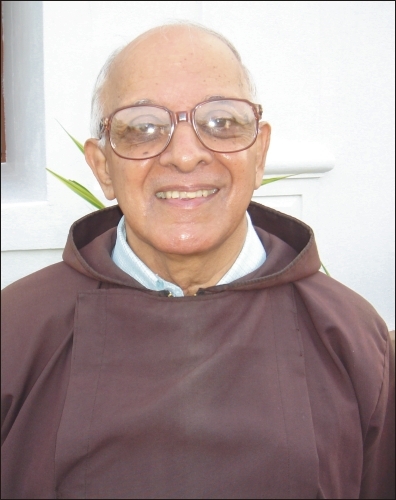 It was with great disbelief that we the friars of St. Anthony Vice-Province of Goa, received the sad news of Bro. Felix’s passing away on the morning of 28th of July 2009. Bro. Felix had been ailing for quite some time. In November he was admitted in the hospital for a minor stroke, but came out of it with great cheer and hopefulness. There after he took meticulous care of himself, dieting and exercising, to keep himself fit. Things seemed to be working quite well for our brother. Occasionally he would experience sister sickness knock at his door. In all this he didn’t loose his cheer. On 10thJuly he celebrated his 61st birthday with great joy in the midst of his friars and relatives. He spoke cheerfully bringing joy and laughter to those gathered around him. Least did we realize that he would slip into coma a couple of weeks later. The doctors informed us that his kidneys failed and he suffered a heart attack. We battled for his life but to no avail. Exactly after a week in hospital, at 8.30 am on the 28th July 2009 Felix our brother passed from this life to the next. Tears rolled, the heart ached, we stood in silence trying to grapple with the reality of his death. The funeral service conducted on 31st July in the presence of the Archbishop of Goa, along with the large congregation present to bid farewell, spoke volumes of the gift that Felix was to us. Bro. Felix was born on the 10th July 1948 at Guirim. Son of pious parents Mr. Januario Crecino Ferrao and Mrs. Maria Magdalena Ferrao, he was the youngest of four siblings. He studied at St. Anthony’s, Monte de Guirim, where he was inspired to the Franciscan Capuchin way of life. He joined the Order in 1968 and made his first profession on 31st May 1974 and final profession on 22nd May 1977. On 29th May 1977 he was ordained a priest. His first posting was at Padre Pio Friary, Navelim, as Director of the aspirants, where he won the hearts of the students as he guided them slowly but firmly in their vocation. In 1980 his superiors found him worthy to get himself qualified in Rome where he did his licentiate in Catechetics at the Università Salesianum. On his return he was appointed as Guardian at Padre Pio Friary and Director of aspirants. From there he was transferred to Monte de Guirim as the Boarding Director. In 1989 he was appointed as parish priest at Revora where he administered to the pastoral needs of the people. In 1993 he was transferred again to Monte de Guirim where he did his M.A and B.Ed studies, while also performing the duties of the economo of the house. In 1996 he was elected as definitor of the then united KGM Province. In the same year he was appointed as Guardian of Alverno Friary and Headmaster of St. Anthony’s school, Monte de Guirim. In 1998, when the division of the Province took place, Felix was appointed as the first Vice-Provincial of the newly erected Vice- province of Goa, a post he held for six years. During this time he was also elected as the President of the CCMSI. In the last years he served at our friary at Cuncolim, for a short time in the General Vice-Province of Arabia and finally at Navelim where he was presently the Director of Aspirancy. Felix was a simple, joyful and a contented brother who always wore a smile on his face. He had a special gift of encouraging the brothers. He was genuinely interested in the well-being of all his brothers. He was a prayerful brother who practiced a profound faith in God and in whom he found his solace several times during the day. An ardent follower of St. Francis of Assisi, he lived his religious life in simplicity and humility. May God reward you as you share eternal life with Him in the company of all the angels and saints. Adieus Bro. Felix, what you became is God’s gift to us. “Give your best and God will help you to do the rest.” These words were always in the heart, mind and on the lips of our Bro. Godwin Lobo as he sort to live these words in his life. His commitment to life was based on this realization that we are God’s gift to one another. And so he reached out to others with care, concern and generosity. Bro. Godwin was born on the 30th January 1947 at Candolim. Son of pious parents Mr. Joaquim Xavier Leslie Lobo and Mrs. Idinha Humiliana Lobo, he was the eldest of three siblings. He passed out from St. Anthony’s, Monte de Guirim, where he was inspired to the Franciscan Capuchin way of life. He joined the Order in 1963 and made his first profession on 1st May 1966 and final profession on 19th December 1976. On December 19,1976 he was ordained a priest. He was a person with multiple responsiblilites. He has served in many friaries in Goa. He was in Alverno Friary – Guirim, Padre Pio Friary – Navelim, St. Lawrence Church – Sinquerim and Our lady of Victories Church – Revora. He was a teacher in St. Anthony’s High School – Monte de Guirim – Goa as well as performed the responsibilities of the acting Head Master in an efficient way. After his retirement he joyfully accepted to be a missionary in Mexico where he breathed his last serving the people in Mexico. He left for Mexico on 18th March 2008 and it was God’s will that he breathe his last there…. This was in short a flash back on the life of late Fr. Godwin Lobo. Godwin was a simple, joyful and a contented brother who always wore a smile on his face. All the students who he taught liked his way of teaching and guiding. He had a special gift of encouraging the brothers. He was a prayerful brother who practiced a profound faith in God and in whom he found his solace several times during the day. An ardent follower of St. Francis of Assisi, he lived his religious life in simplicity and humility. May God reward you as you share eternal life with Him in the company of all the angels and saints. Adieus Bro. Godwin, what you became is God’s gift to us. Many Goans migrated to Mumbai (Bombay) in the early 60s for better prospects. Many others made frequent visits to the land of opportunities those days. Dominic and Maria from Porvorim were no different. They too had been to Mumbai where they collaborated with God’s plan to welcome in this world their little angel Gustav Pereira on 26th October 1933. God’s gift grew in stature steadily and solidly in Mumbai but his heart was beating for Goa. He got himself enrolled in St. Anthony’s High School, Monte de Guirim in 1948. As a young school lad he was enamored by the brown habit and the long flowing beard of the Monte Capuchins. He was hooked. He went home and told his parents “I want to be a Capuchin”. After finishing his high school he joined the Capuchins. He was sent to Monte Mariano Friary (Farangipet) in Mangalore as a novice where he took his simple vows in 1952 and took the name of Theodore. His formators finding him fit for studies and for capuchin life sent him for his philosophical studies to St. Anthony’s Friary in Quilon where he stayed till 1956. From there he was promoted for his theological studies to St. Joseph’s Friary in the hill station of Kotagiri (Next to Ooty). Being a serious and dedicated student he passed his seminary training with excellence. He was ordained a priest in 1959 a time when the universal Church was preparing for the historical and memorable Second Vatican Council. Even after ordination he loved to serve the people of Kotagiri with his genius in music for which he is remembered by the local people even today. His contribution to music in Kotagiri will be remembered for a very long time. 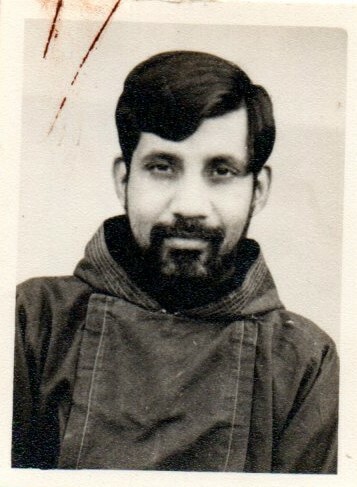 The Goemchi xith-koddi invited him to Goa in 1961 where he was placed in his alma mater, St. Anthony’s High School, Monte de Guirim as a school teacher, chaplain and assistant Boarding Director. At that time the boarding had nearly 700 boys and the school was at its pinnacle especially in sports. His heart was divided between Goa and Kotagiri. He was wanted and needed in both the places. This time kotagiri was the winner. He went back there in 1963 as a professor of theology, liturgy and music. After three years of nonstop teaching his superiors decided to send him for higher studies in liturgy and music. In 1966 he marched to the eternal city of Rome. Overcoming the racist attitude of the westerners those days he did his masters in music and liturgy. Br. Theodore came back in 1972 as Doctor Pereira. This time again it was Kotagiri that captured his attention. He went there as a well qualified professor of Liturgy and music. The one big Capuchin province was now divided. Fr. Theodore was posted in Deena Seva Ashram Bangalore in 1981 as a prefect of formation and Lector. He was a man of prayer and duty which he did extremely well till 1984. He then found himself once again in Goa serving the various capuchin houses in Goa. He has lived most of his life in Alverno Friary Guirim and some years in Navelim and Cuncolim. He served the Arch Diocese of Goa as an Episcopal vicar for the religious for a couple of years. He represented various commissions on liturgy and music both nationally and internationally. He worked very hard in Goa to promote vocations for the Capuchin order. He went about with his camera making slides for his talks, with his violin conducting choirs, with his pen writing books, with saplings planting trees. He had great thirst for learning and for finesse of things. A man well educated who believed in quality of work and purity of thought. His contribution to St. Anthony Capuchin Province of Goa is immense. Thanks to him today Goa is a Province, our documents of various houses in order, many youngsters entered the order. Last few years Fr. Theodore was not keeping too well. His lifelong enemies were his varicose veins and diabetes. At the end his body became so ‘sweet’ that it had to leave this earth. He is now buried in the new Cemetery of the Province in Alverno Friary. Adeus Brother! May God give you the reward you deserve! “The Lord gave, and the Lord has taken away; blessed be the name of the Lord” (Job 1:21) cried his aunt/mashen when we went to her house to inform about the shocking news of the untimely demise of our beloved friar Br. Agnel Colaco. But why his aunt? That’s because his aunt for all practical reasons became his mother. He grew up in her bosom right from the age of two. Sudden death is a heart rending experience to our near and dear ones. When a beloved member of the family/community dies we too die a little. The family members just like us were stunned hearing the tragic news not knowing how to react. The death of Br. Agnel has brought down the curtains on his promising future as a missionary in far off lands in Mexico. Willingly he went as a missionary. Jesus says pray to send labourers, harvest is plentiful. He wanted to be one of those few labourers who wanted to work for the Lord in mission areas. Even in Goa he worked three years on our Capuchin Farm in Valpoi. His family members wondered why he chose to be a missionary in Mexico far away from the loved ones. Those who lived with him and knew him well remember him as a little cute fellow with chubby cheeks, simple in life style, very loving and affectionate. He was a soft spoken and caring brother; very approachable and hospitable, never troubled anyone. Br. Agnel, the son of late Caetano Colaco and Late Joanita Colaco was born on 11th March 1976. Though born in Navelim he was brought up in Curtorim. He was vested with the Capuchin habbit on 15th May 2000, made his simple profession on 16th May 2001 and was finally professed on 4th May 2008. He received the sacrament of ordination on 21st January 2010. Soon after his ordination he was posted to Padre Pio Friary as a member. From there he was transferred to our Capuchin Farm in Valpoi. From there he was once again brought back to Padre Pio Friary-Navelim as the economo of the house. From Navelim he left for Mexico as a missionary on 2nd November 2015. After bidding adiós to their querido padrecito the Mexican friars sent his mortal remains to India which reached Goa on November 5, 2016.ember. Br. Agnel’s superior in Mexico Fray David Joseph Beaumont Pfeifer OFM Cap wanted to come to Goa to pay a condolence visit to out Province but could not get the visa. The funeral mass was conducted in Padre Pio Friary at Navelim. Br. Dinesh Mendonca the Provincial Minister celebrated the Mass and Br. Nelson Lobo the Vicar Provincial preached the sermon. After the funeral service at Navelim the body was taken to Monte de Guirim Friary for burial. Many people by their private vehicles and pre arranged buses went all the way to Guirim to bury their beloved. Querido Padrecito / the little father will be missed by all of us. -By Br. Nelson Lobo OFM Cap. The death of a priest is unlike the death of any other. We feel it differently, deeply, because the voice that once spoke of God is now silent; the hands that once blessed cannot bless anymore. The kindness, goodness and gentleness which he manifested will always be desired. A priest represents Christ and infact is a great loss to the Church. Fr. David was born to Jaime Sousa Filinto & Judit Silva souza Filinto. Born: 23/7/1923; died: 10/01/2018. He was second among the ten siblings. And three among them, including Fr. David, were religious. He was ordained: 06/10/1946 (Rachol Seminary). He was ordained as a Diocesan priest, but then he realized that he was called to be a religious and especially a Capuchin Franciscan. After discerning the will of God and consulting his superiors he decided to be a religious. And so on 5th January 1947 he took the religious garb/habit and began his novitiate at Farangipet, Karnataka. After a year, on 14th February 1948, he made his Simple Profession of Vows, and then he made his solemn/ perpetual profession of Vows on 14th February 1951. It is interesting to note that, from 9th November 1948 to 11th December 1949, before he could make the Solemn Profession, he was appointed as the Assistant Novice master. It fact it was a rare privilege given to Fr. David, to take up an important appointment even before making his Solemn Profession. It just tells us about the great personality of Fr. David. 1949 – 1950 – St Anne’s Friary, Mangalore. 1950 – 1955 – Monte de Guirim, Goa. Teaching, preaching, social and chaplin to Mae – de – Deus. 1955 – 1962 – Angola, Africa. 1962 – 1966 – Bombay – Kirol, Fatima Friary. (Teaching, parish work, social work and vicar of the house). 1966 – 1972 – Philippines (Social Work and Parish). 1972 – 1982 – Navelim – During these years, he was appointed as the Assistant Parish Priest at Grace Church Margao and it is at this time, that he looked after the construction of the Church. He was also responsible to built a new block for the orientation brothers at Navelim. 1982 – 1986 – At Revora, Our Lady of Victory Church. 1986 – 1991 – Monte de Guirim (Preaching, SFO, prison ministry). 1992 – 1999 – He opted to work at Papa New Guinea. 1999 – February to May – Revora. 1999 June to 2005 – he was assigned to the Parish of Sinquerim. 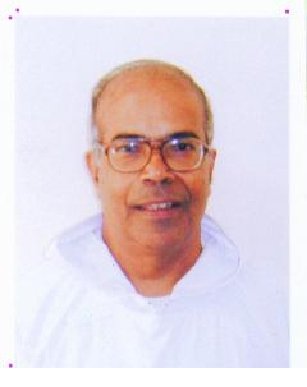 2005 – 2008 – Chaplin of St. Alex convent Calangute but a member of Alverno Friary. 2008 – 2018 – Monte de Guirim. These are the places he worked at and the missions he opted to serve. God gifted Fr. David with: 70 years of religious life and 72 years of priestly life. In all places I have just mentioned, Fr. David, worked in different capacities. As an Assistant novice master, worked with prisoners and took up the prison ministry with great dedication, served as a missionary at Angola, Philippines and Papa New Guinea. He would drive the jeep, repair it on his own, travel to different mission stations and sub-stations, have his food and even sleep in the jeep on the way to his missions. He was the Spiritual director of the Secular Franciscan Order, built churches and friaries and as a parish priest consolidated communion and unity in churches and fraternities. He was known for his preaching, an exemplary friar to live the vow of poverty, responsible, dedicated, committed and hardworking in all the capacities he worked at. If I may also mention it, Father was hardly a person much attached to worldly possessions. He had little and seemed to need little, but he was generous, charitable and kind, disciplined, strong and firm. He would never miss the Rosary, celebrate the Eucharist and had great love for Christ and his Mother. He bore his pains silently and the sorrows he manfully endured, did a lot of unseen spiritual good. He knew God and his people. He was passionate in all he did within the parish, and the missions and this was reflected in his homilies, it became a great combination for preaching the word of God and for the many ministries he stayed connected with the people of God. It is always hard to say good bye specially if the person has made unforgettable memories in our minds. As we bid you goodbye Fr. David, as you continue your journey towards heaven, it is our sincere prayer that God bless you and reward you for being a faithful servant. May you have all the angels and Mother Mary to welcome you in paradise. I would like to quote the words of St. John Chrysostom. If Christ is with me, whom shall I fear? Though the waves and the sea and the anger of princes are roused against me, they are less to me than a spider’s web. For I always say: Lord, your will be done; not what this fellow or that would have me do, but what you want me to do. That is my strong tower, my immovable rock, my staff that never gives way. If God wants something, let it be done! If he wants me to stay here, I am grateful. But wherever he wants me to be, I am no less grateful. The corridor is silent, the room is vacant, another leaf has fallen, but a Capuchin brother like Fr. David will never be forgotten. By Br. Domingo Ferrao OFM Cap.